If you spent two hours walking around Chicago’s downtown from Millennium Park to Des Plaines Avenue, you could easily find three dozen sculptural works by world-class artists, spanning over a century of the city’s history. By just walking down Clark Street you can find In four blocks alone – between Adams and Randolph –works by Picasso, Chagall, Miró, Dubuffet, and Calder. 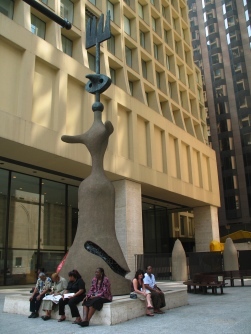 Squeezed between a government office building on the corner of Dearborn and Washington and the First United Methodist Church of Chicago just to the west stands Joan Miró’s Moon, Sun and One Star, affectionately known as Miss Chicago. According to the Chicago Public Art website, hosted by the city . . . The playful poetic images of Joan Miró’s art comprise a private mythology derived from the artist’s memories of his homeland in Catalonia, Spain. Using his unique visual symbolism, Miró imbued this sculpture with the mystical presence of an earth deity, both cosmic and worldly. Shapes and forms found in this composition evoke celestial imagery and common objects. The bell-shaped base draws the viewer’s gaze downward, symbolizing Miró’s association of the female form with the earth. The sphere above represents the moon while the shape of the face is like a ceramic hook. The fork projecting from the top of the head is symbolic of a star, with individual tines representing rays of light. The sculpture of steel, wire mesh, concrete, bronze and ceramic tile was originally proposed in 1967, but with all heck breaking lose in city streets as 1967 turned into 1968, the city found it could not afford the moon, the sun, not even one star. In the next two years Miró cast eight 5-and-a-quarter inch maquettes, one of which is today in the Milwaukee Museum of Art. Over a decade later Mayor Jane Byrne (The people ask much, often more than any government can give. We must resist the temptation to promise solutions to all problems.) 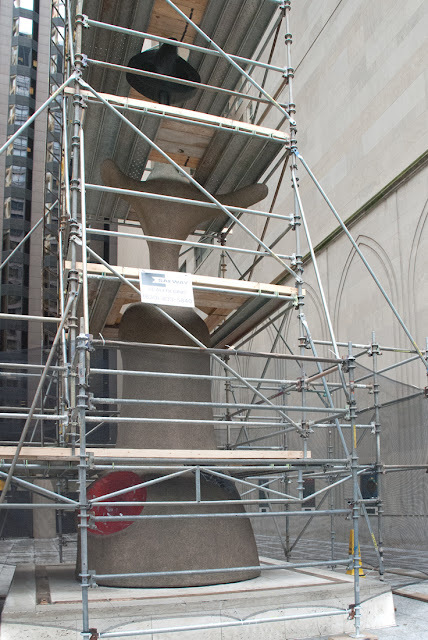 found a quarter-million dollars which was matched by private contributions to go ahead with the sculpture. On April 20, 1981 the sculpture was unveiled. Less than two weeks after the work was unveiled a 24-year-old machinist, Crister Nyholm, put Mr. Artner’s words into action when at 4:50 p.m. he threw an orange juice container filled with red paint at the sculpture. It didn’t reach the stars, but it splattered onto the sculpture about halfway up the piece and dripped almost to the pavement. “I just don’t like the statue,” Mr. Nyholm told police. Miss Chicago – she’s easy to miss, shoe-horned in a little “plaza” between church and state, the great Picasso piece smirking at her little cousin huddling in the shadows across the street. These days it’s even tougher to see the Miró piece as it stands under a shelter of scaffolding and mesh while sun, moon and star get a facelift.